Since more than 30 years Conic System is manufacturing Seeder Machines. Following the request from our Customers, we developed new systems adapted to their needs. 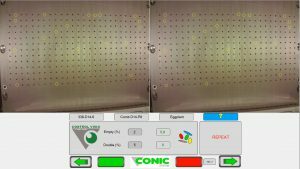 Not long time ago, we created a new control system for the Plate Seeder Machines DECOP 305 which lets to get a much more effective sowing, by means an Artificial Vision System to control the processes. The DECOP 305 belongs to the Seeder Line CONIC SYSTEM PRO335. The whole line is programmable and has Automatic Adjustments. This system lets the Nurseries upgrade their quality and to standardize the sowing procedures. With the new CONTROL VISIO in the Seeder Head, we can supervise the seeds selection directly before to be sowed, being available to define which precision we want and guaranty a seed in every alveoli. The system analyses the seeds in the plate. If the percentage of failures (empty or double) is bigger than we accept, the seeder will repeat the placing seeds on the plate until the performance will be right. The system also adjusts the aspiration and speed of the seeds tank to get the better results. With this sowing control new system, we can assure that the DECOP305 has 100% accuracy. To get more info, please contact us filling this form or calling us +34936548980. Visit us to see the DECOP 305 in our Booth 3A72 in the Hall 3.